written permission of the author is prohibited. 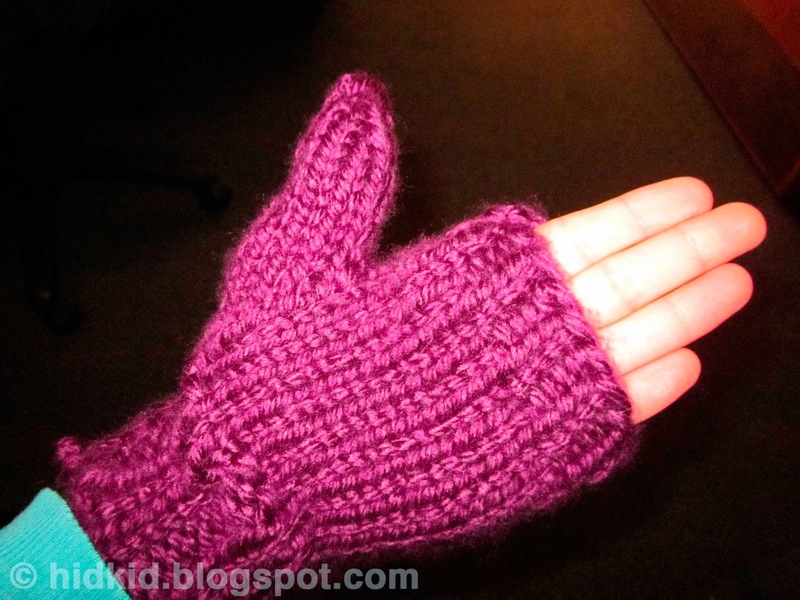 Mittens are great. 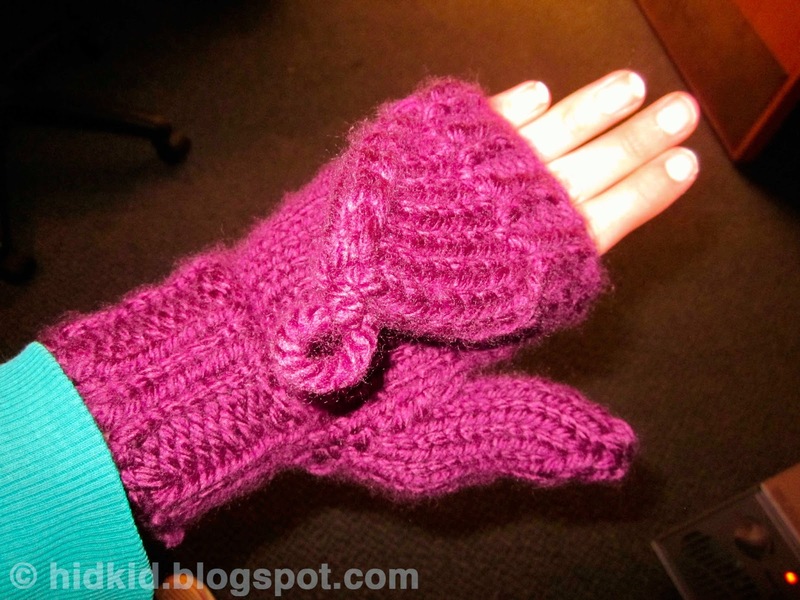 They allow fingers to snuggle together and stay warm during those winter days. 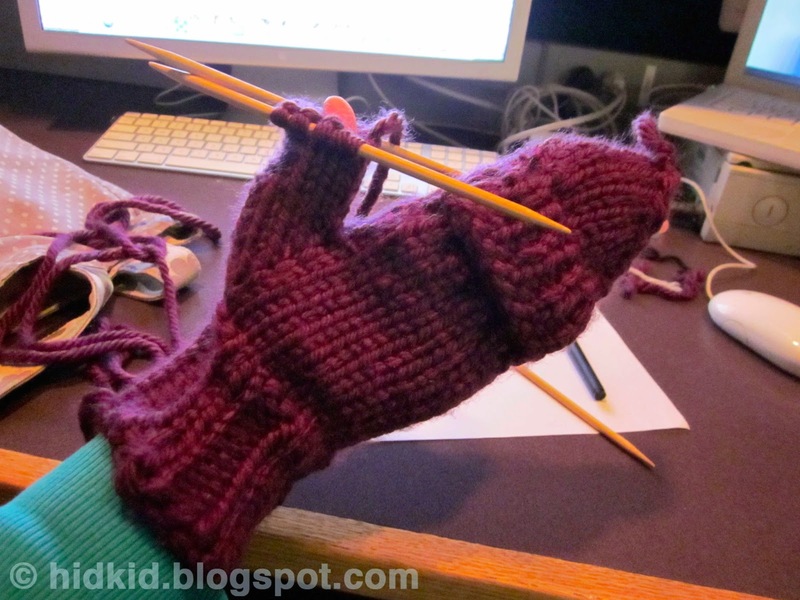 But then to use your fingers, the entire mitten has to come off to let the fingers be mobile and all that conserved heat is lost. 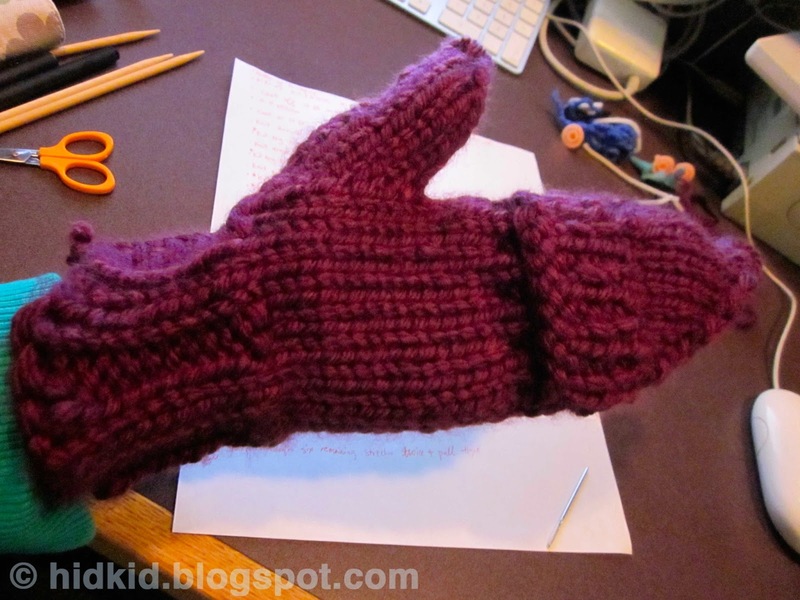 Solution = mittens with flaps! 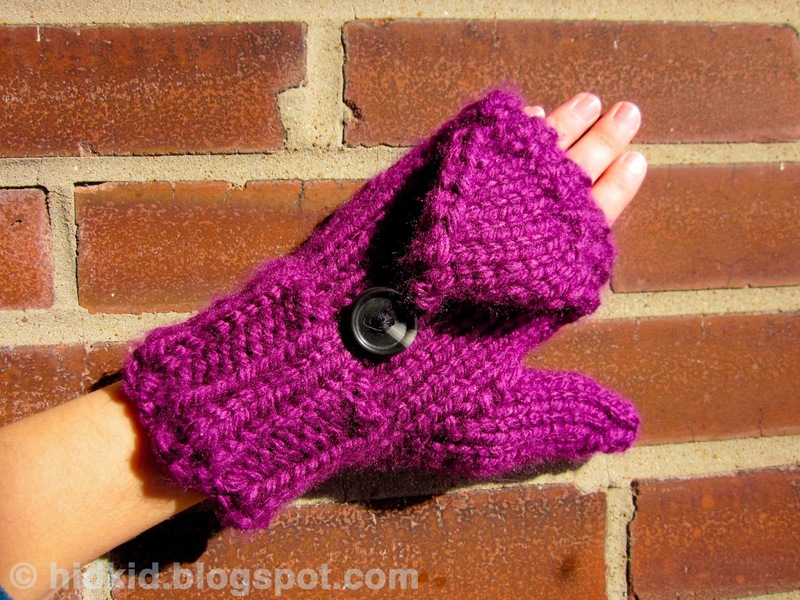 If you can make mittens, you have all the tools to make mittens with flaps. Just follow along with this simple tutorial. 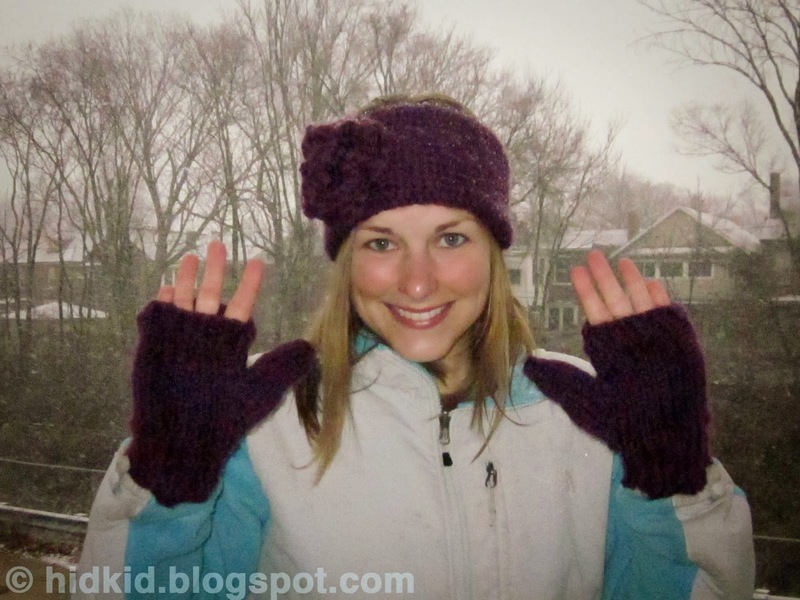 I used a super bulky yarn for these mittens to make them as warm as possible, specifically Lion Brand Hometown USA in Portland Wine (I guess plum wasn't fancy enough :)). I used size 8 double pointed needles and a yarn needle. My gauge for this yarn is 9 stitches is 3 inches in stockinette stitch. Height is not important for the gauge as you use your hand to measure when to make the flap and when to decrease for the fingers. 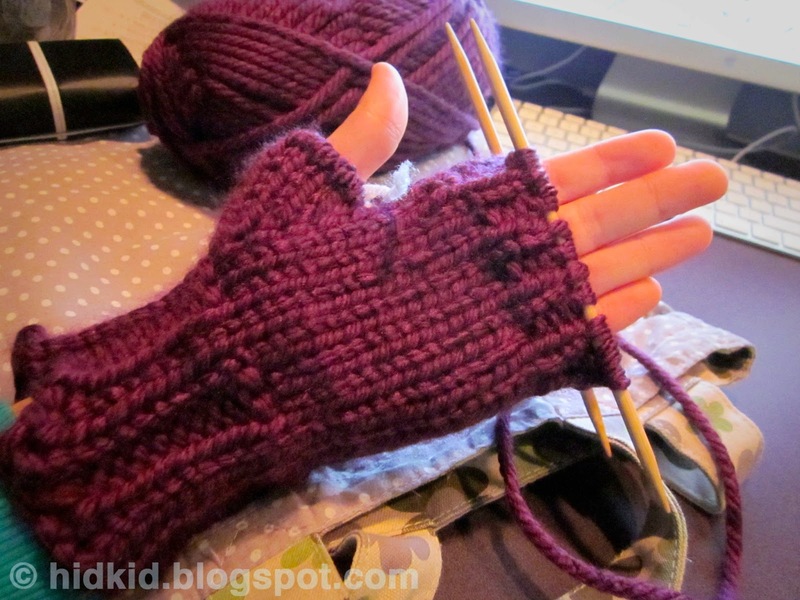 I think these mittens should take about 1 skein of yarn, as I started this with the leftovers of one skein and finished them with yarn to spare on the second skein. 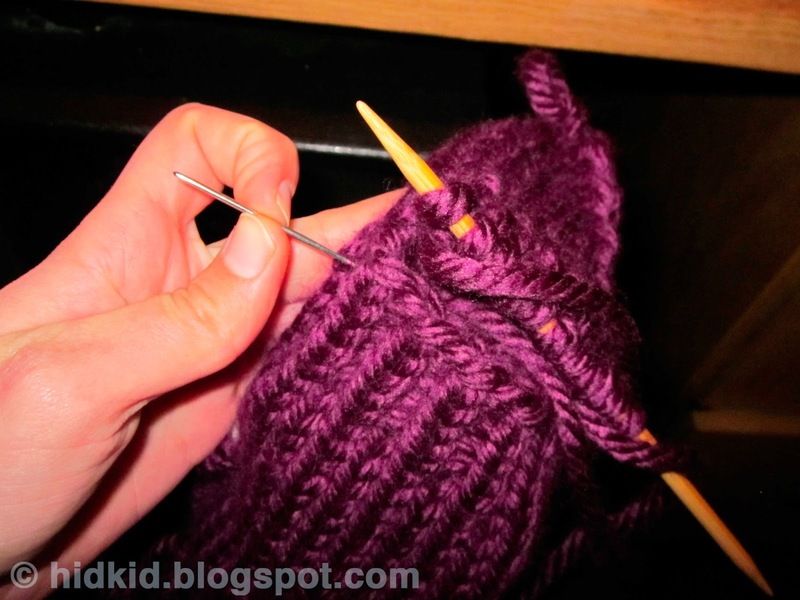 Step 1: Cast on 20 stitches and divide to two needles, 10 stitches per needle. 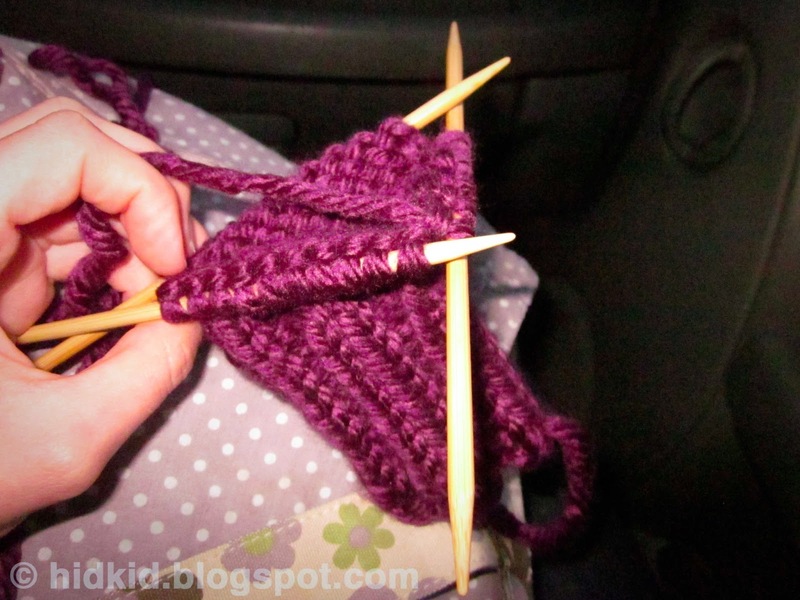 At this point I put all the stitches that result from making stitches onto a third needle. 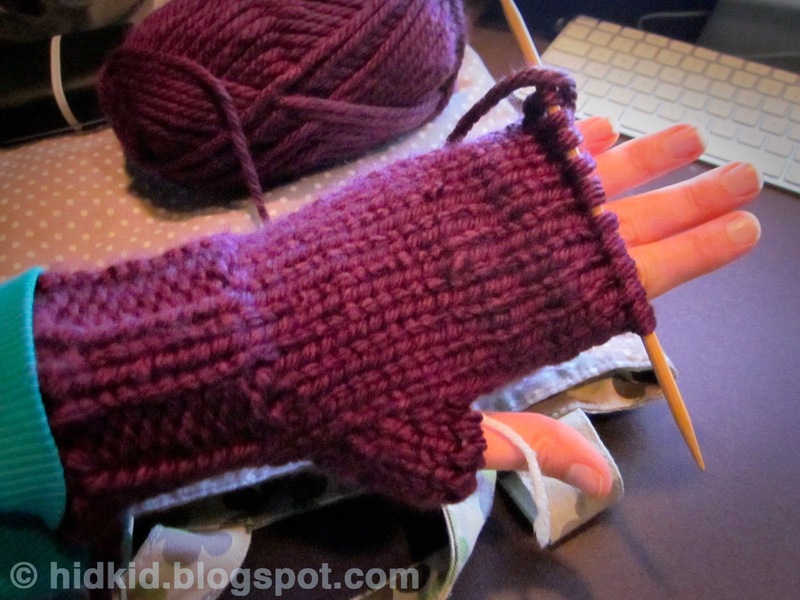 These stitches will become the thumb gusset. 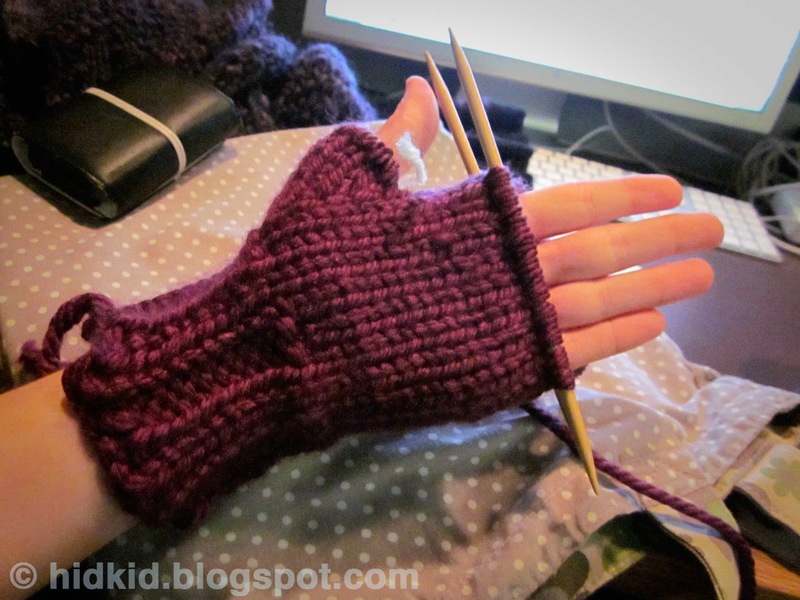 From now on, I will color all the stitches that should be on the thumb gusset needle blue. 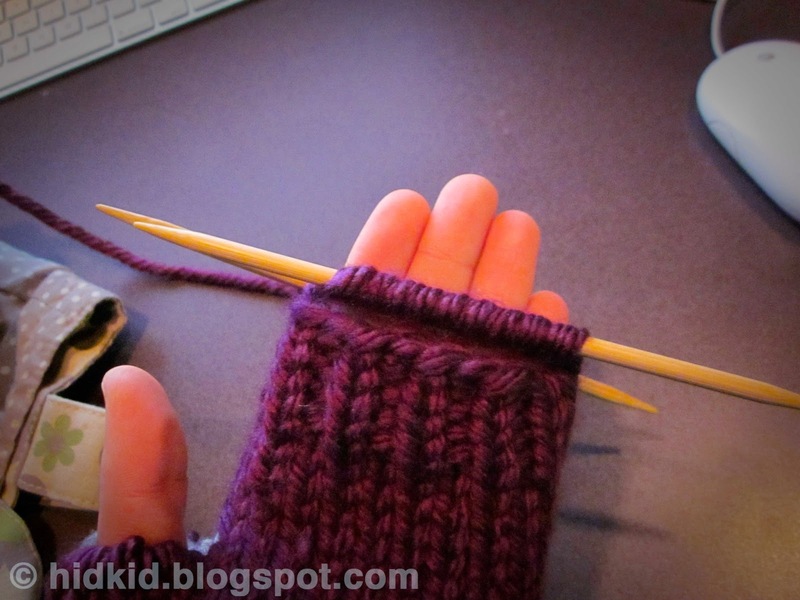 To make the thumb gusset, you will also need to use the make 1 stitch (M1). 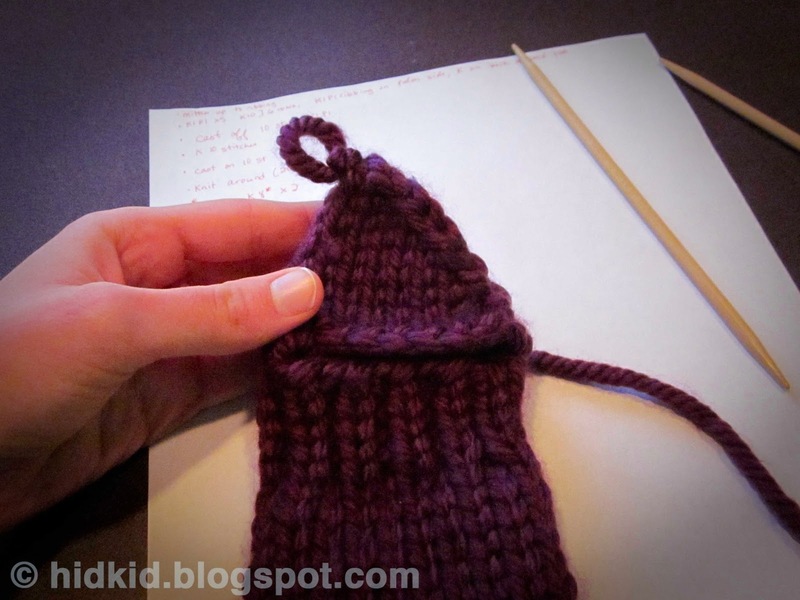 Click here for a video tutorial of this stitch. 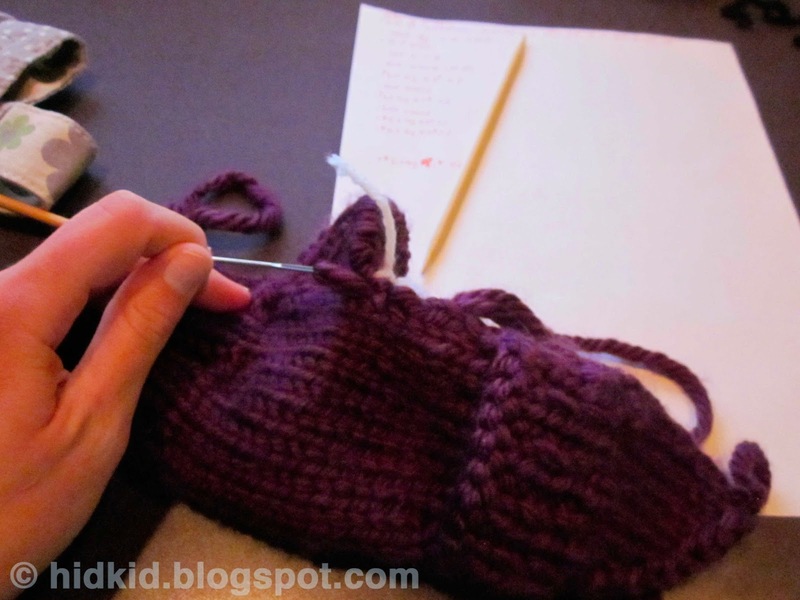 Now transfer the 11 thumb gusset stitches to a stitch holder or use a yarn needle to sew a scrap piece of yarn through each of the 11 stitches to hold them in place. 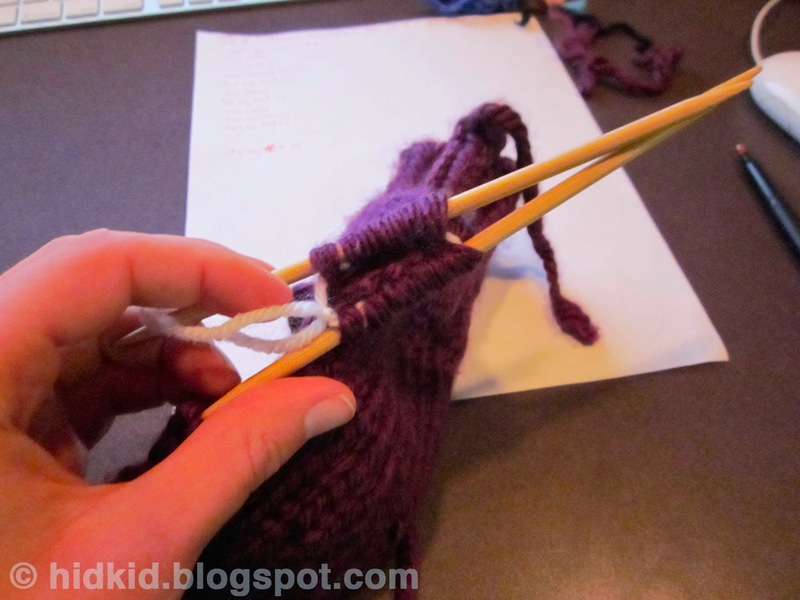 You should now have 10 stitches per needle. 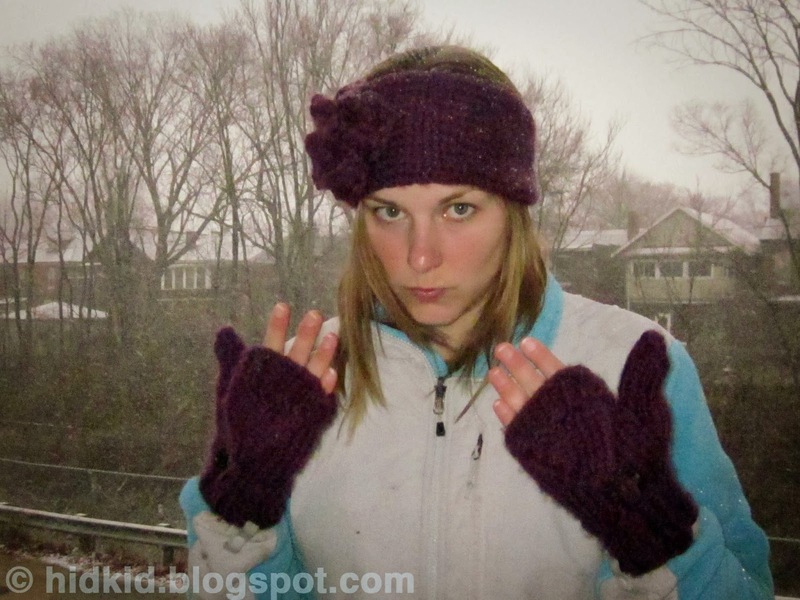 Cast off 10 stitches in K1P1 pattern, Knit 10 on back side of mitten. Cast on 10 stitches, connect to back side of mitten and knit 10 stitches on the back of the mitten. Knit 10 stitches over the stitches you cast on. 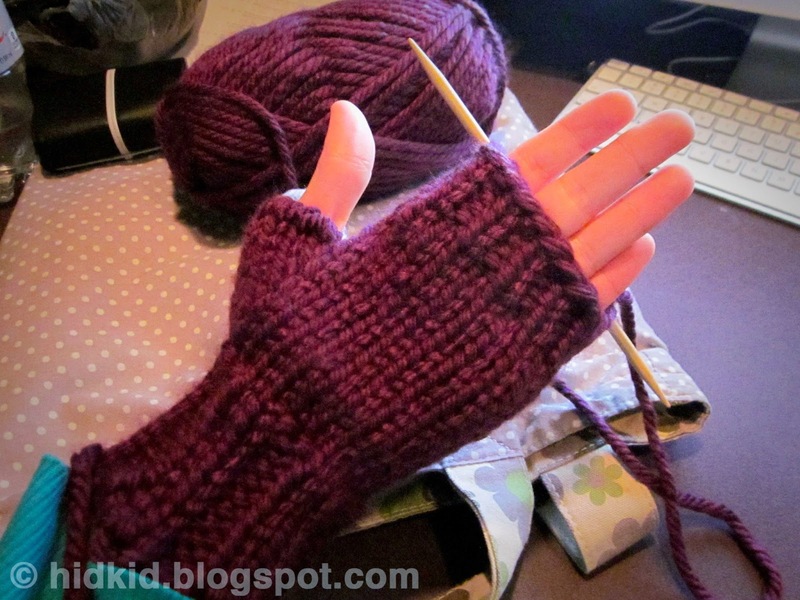 Try on the mitten and if you are at the level of your pinky, it is time to decrease. 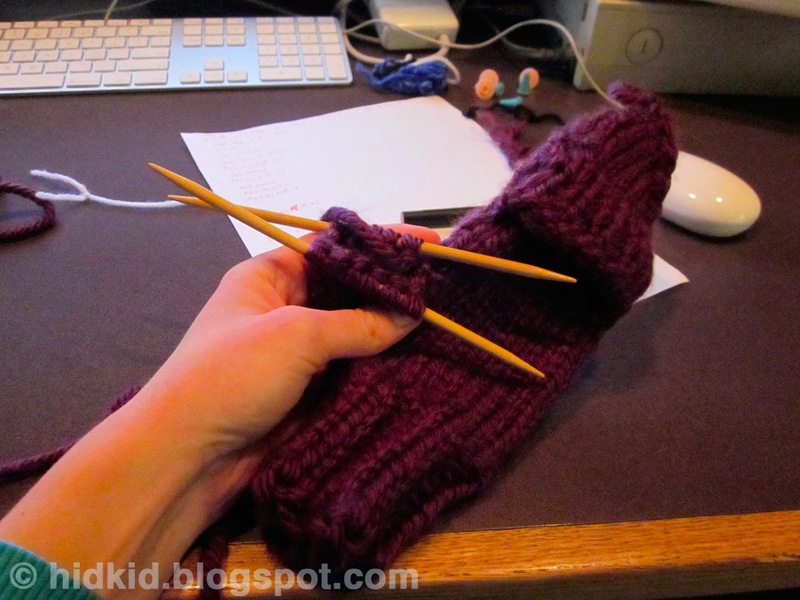 If not, continue knitting until that point. Cut a very long tail (at least 2.5 yards) and using the yarn needle, weave the tail through the remaining stitches twice and pull tight. 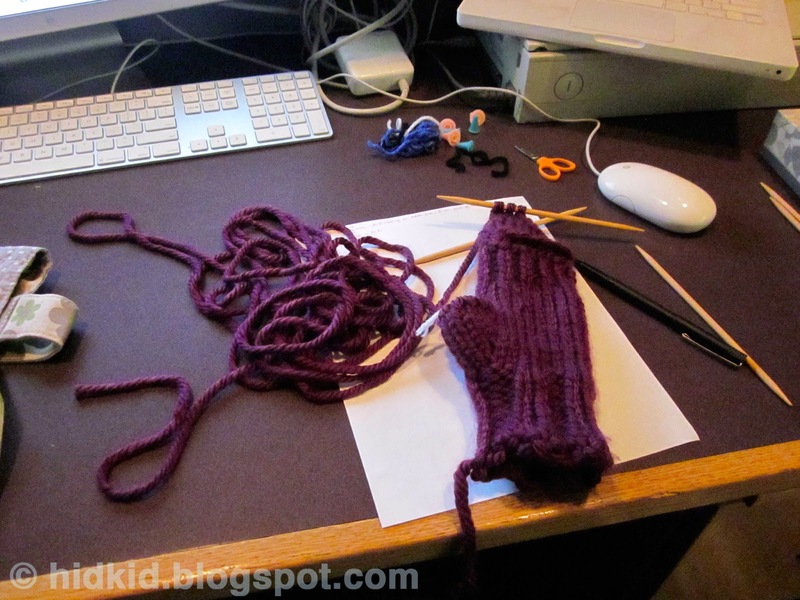 Then sew the tail through the top of the mitten and tie it to leave a small loop as shown in the picture. 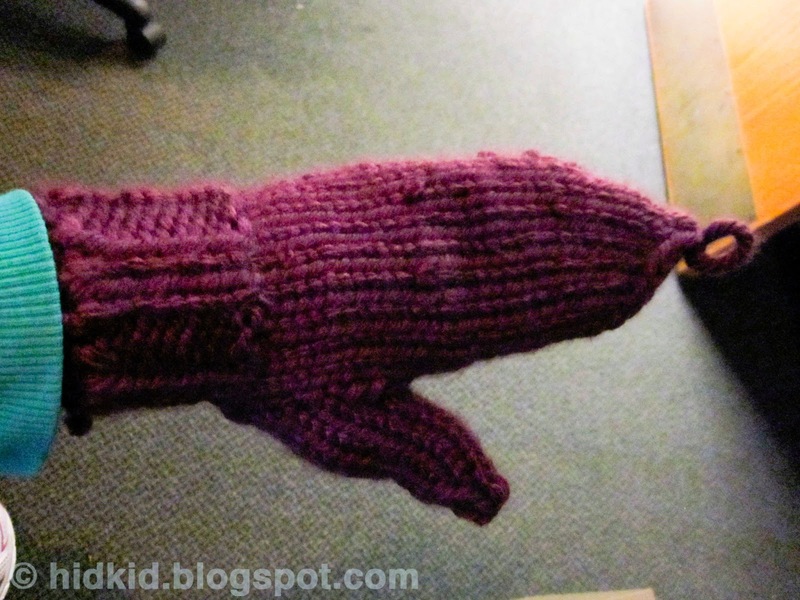 Sew the tail down the side of the mitten until you get to the flap. 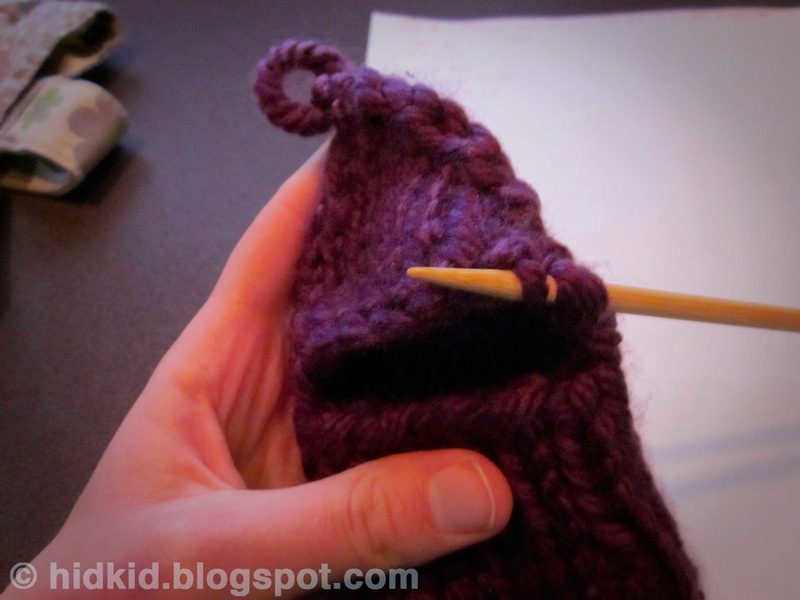 Insert one double pointed needle into each stitch on the top of the flap. 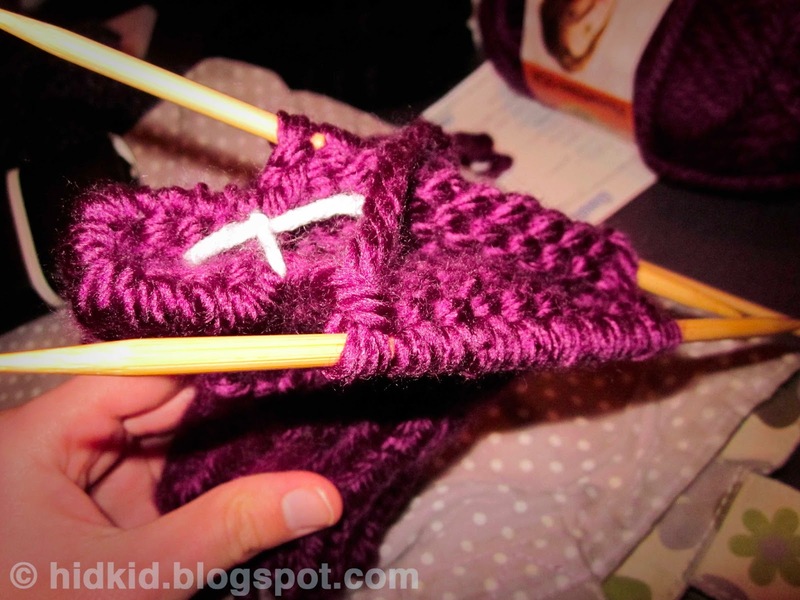 Using the tail yarn, K1P1 across. 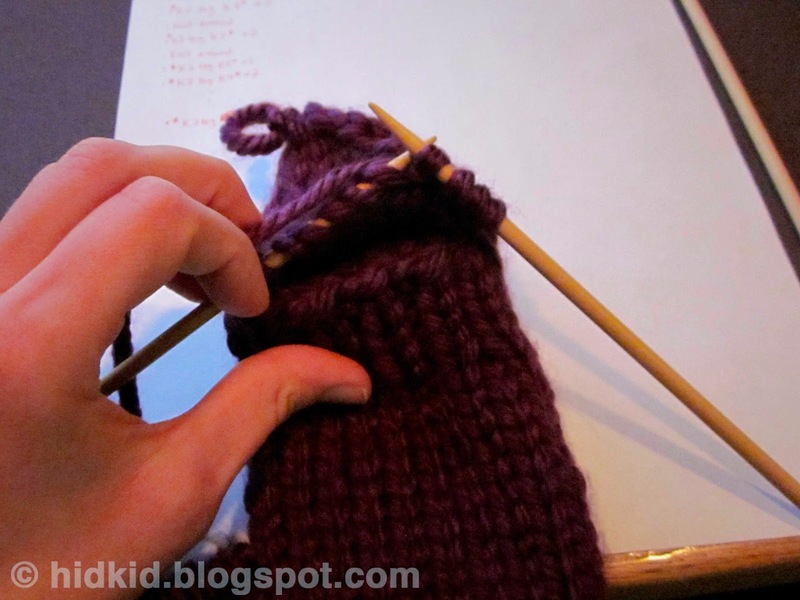 Sew the end of the tail through the side of the mitten from the inside to the outside slightly below the level of the row you just knit across. 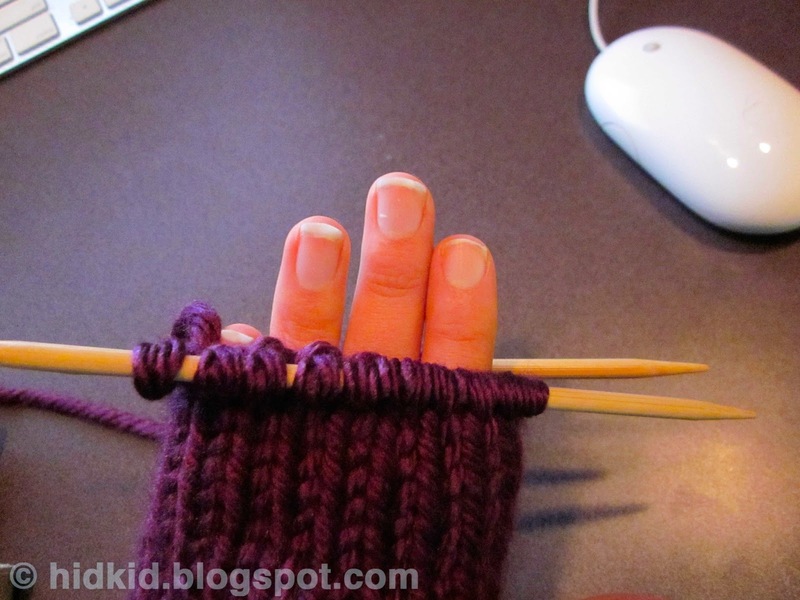 This will secure the flap you are knitting over the mitten so that the gap created by the flaps will be covered. Repeat K1P1 and securing the flap to the sides as shown in the pictures for 6 rows. 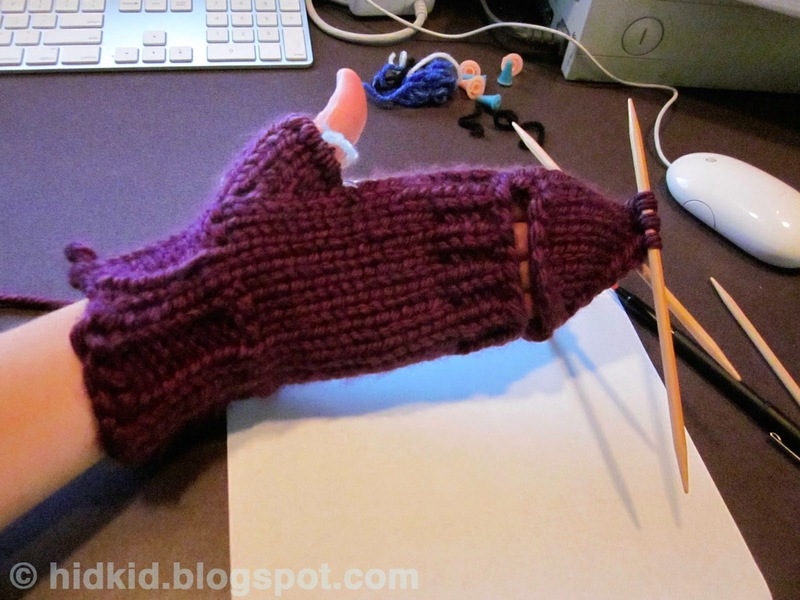 Cast off and then sew the remaining tail down to the thumb gusset. 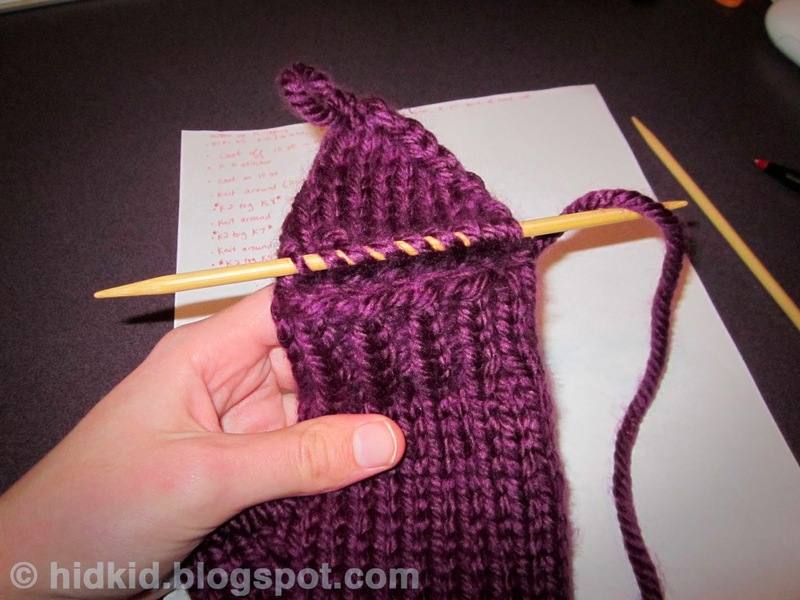 Insert two double pointed needles into the thumb stitches so that one needle has 6 stitches and the other has 5. 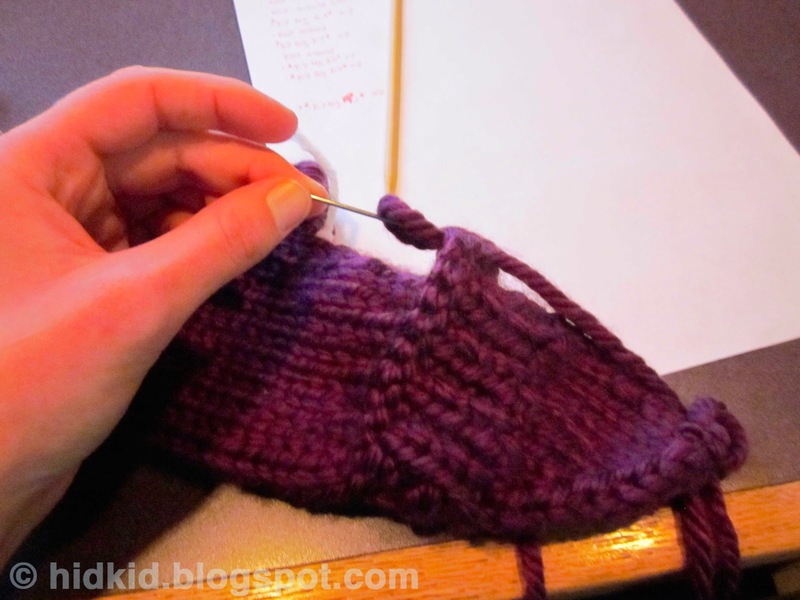 Using yarn needle, pull yarn through the remaining 6 stitches twice and pull tight. 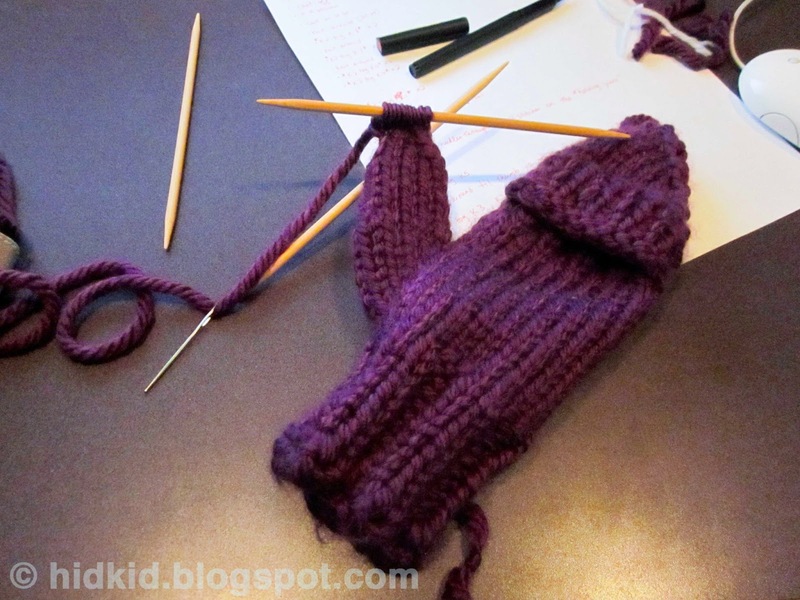 If there are any small holes by the thumb gusset, sew them closed now and then weave the end of yarn into the interior of the mitten and secure by tying.